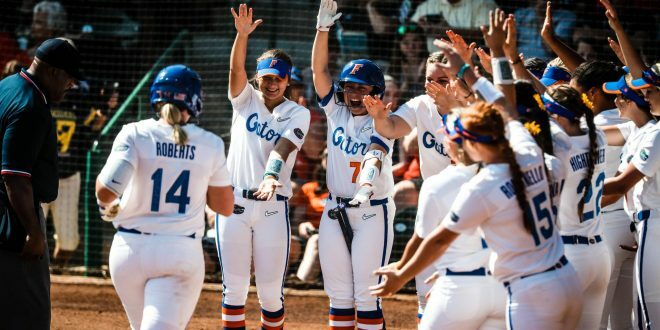 The Gators continued their strong play in the USF Invitational with wins against the Michigan Wolverines and Arizona Wildcats as Kelly Barnhill stole the spotlight. Barnhill continued her strong start to the season pitching a complete game shutout giving up just two hits while striking out five Wolverines. Michigan had no answer for Barnhill and the Gator defense. The Gators opened up the scoring with an RBI single by freshman third basemen Hannah Sipos in the top of the second inning. A triple down the rightfield line for catcher Kendyl Lindaman in the third inning extended the Gators lead to two. Florida essentially put the game out of reach with a four-run seventh inning. Outfielder Jamie Hoover got things going with a two-run double for her first hit of the day. Amanda Lorenz stood out for the Gators recording three hits in four plate appearances while scoring two runs. Barnhill struck out the final two batters of the game to close the door on Michigan as the Gators would pick up their second win of the season. In the second game of their doubleheader, Florida defeated the Arizona Wildcats 3-2. The Gators got on the board first as right fielder Danielle Romanello took Arizona starter Taylor McQuillin to deep center with a two-run homer in the bottom of the first inning. Arizona’s Dejah Mulipola and Florida’s Jordan Roberts each had a solo home run in the second inning. Natalie Lugo performed well for the Gators in just over three innings of relief while picking up the win for the Gators. The Wildcats pulled within one run on a Malia Martinez home run in the sixth inning. Any hope Arizona had left as Kelly Barnhill trotted out to the mound to close the game for the Gators. Barnhill shut the door on the Wildcats to finish off a dominant day. The Gators will finish the tournament tomorrow with games against the N.C. State Wolfpack and South Florida Bulls. Florida seeks to continue its strong start to the season before returning home for an exhibition match against Japan. Florida will travel to Tempe, Arizona next weekend for the Littlewood Classic. Coverage of that tournament can be found over the radio on WGGG 92.1 FM/1230 AM & WMOP 100.1 FM/900 AM.